As much historian as artist, Winston Link employed his technical skill as a means to best document his subjects, rather than as a means to enhance his photos for exhibition or sale. He never tried hard to promote his N&W photographs. Indeed, he discovered, shortly after starting his documentation of the railroad, that no one was interested in photos of an old technology, one that was fast disappearing. Consequently, he first became known for his high quality sound recordings of steam locomotives. He released the first of six recording, "Sounds of Steam Railroading," in 1957, years before his N&W photographs began to garner attention. It was only in 1983 that this large group of photos began to receive recognition as works of art. 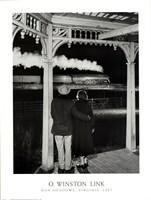 In 1983, several museums in England and the United States organized exhibitions of the N&W photos, and dealers began to sell these photos. It was in this year too, that Link closed his studio in New York City and moved to a home in rural South Salem, a small town in Westchester County, New York, north of New York City. 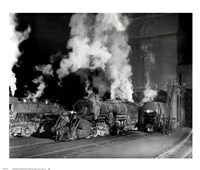 Recognition of his work increased dramatically in 1987 with the publication of the first book of his railroad photos, Steam, Steel & Stars. This was followed by the second book, The Last Steam Railroad in America, in 1995. A number of traveling exhibitions have been seen throughout the United States, Great Britain and Japan. 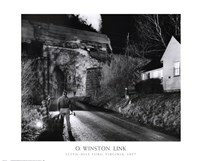 In 2000, a proposal was made for the creation of the O. Winston Link Museum in Roanoke, Virginia, and he agreed upon its location in the historic Norfolk & Western Passenger Station in Roanoke, a building that had been closed for a decade. Winston Link was actively involved with the planning of the museum when, he died of a heart attack on January 30, 2001, near his home.